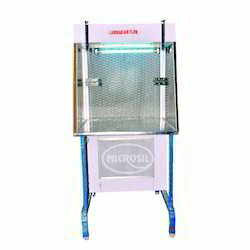 Pioneers in the industry, we offer laminar air flow, biosafe cabinet, biosafe cabinet (s.s) class ii, a-2, biosafe cabinet (wooden) class ii, a-2, fume hood and hepa filter from India. Laminar flow principle involves double filteration of air through coarse pre- filters (upto 5 microns) and Hepa filter (down to 0.3 microns) for filteration of biological and particulate contaminants. A constant uni-directional air flow is drawn from atmosphere and passed through pre and hepa filters on the work surface. Fabricated out of reinforced ply board which is clad in from out side laminated sheet and inner exposed areas are finished in epoxy paint. Table top covered with non-glaring laminated sheet or stainless steel sheet (optional). Side panels are fixed and are made out transparent acrylic sheet. The front door is folding type and made of thick acrylic sheet. (optional) Stand is built in type or detachable. Blower unit has AU or equilavent motor and is dynamically balanced with minimal sound vibration level. Fluorescent lighting is also provided. Switches for Blowers, Flourescent light UV light. Airflow Vertical,70% of the air volume is Re-circulated, 30% Exhausted. We are engaged in offering a wide range of Automatic Angle Grinder to our clients. These cabinets are manufactured in strict compliance with industry-specified quality norms by using raw materials of the best quality. These cabinets are available in different models and illumination numbers. The cabinet material is wooden or cold rolled steel powder coated or stainless steel. Made using stainless steel, the view window is used in the work chamber to monitor the samples. Being a customer oriented organization we are engaged in offering a quality approved the range of Fume Hood in the market. 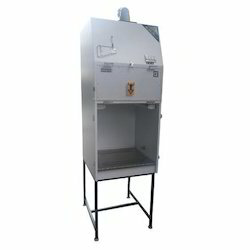 This fume hood is equipped with acid proof ceramic lining or with finely polished granite. 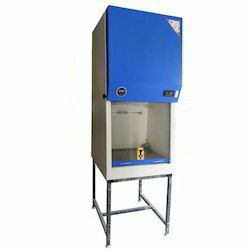 Offered fume hood is tested against numerous parameters in order to deliver flawless range. 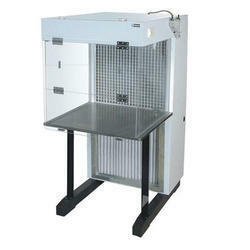 The given fume hood is manufactured by a team of our adept workforce in conformity with the set norms. 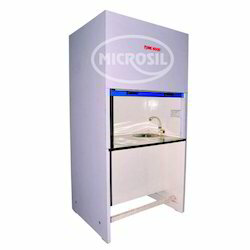 Customers can avail this fume hood according to their varied needs. 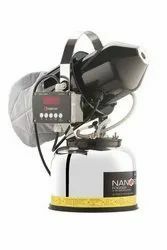 The filter has excellent resistance to chemical including corrosive vapour and most acids except phosphoric and hydro solvents which have little or no effect. These have excellent electric qualities, they neither absorb moisture, swell, stretch nor undergo chemical change through contact with moisture. Filter medium fabricated from fire proof 100% micro fiber glass paper pleated with aluminium/cadmium plated mild steel with exclusive plastic base adhesive. Continuous neoprene sponge rubber seals are provided on filter frame for effective sealing . 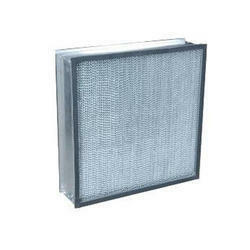 The filter has a filtration efficiency of upto 99.97%, particle retention >0.3 micron and can operate in temperature upto 150º C intermittent 121º C continuous and 100% relative humidity. The filter are tested by the DOP test methods, the most accurate and stringent test. outside and epoxy painted from inside. · > 20,000 Cubic. Ft.
· 230 VAC, 50/60 Hz. · 7 ~ 8 Kgs. 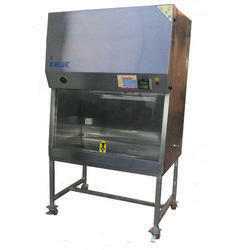 Looking for Clean Air Equipments ?